The world is flooded with digital innovation and technologies like IoT, 5G wireless network & embedded AI continues to increase the pace of change. At present millions of apps are coming online to monitor, measure, process, analyze, react to seemingly storm of endless data making the growth of IoT explosive as well as impressive. Now we all are aware regarding the fact that the internet of Things heavily relies on cloud technology not only to store large amounts of data collected from sensors but also process it. Compute Distribution and Load Balancing- Many edge architecture employs a strategy of placing servers, apps or small clouds at the edge. Fog simply provides a broader system-level architecture that also incorporates tools for distributing, orchestrating, managing and securing resources and services across networks. This provides a great balance of sophisticated computation, networking and storage capabilities and support for heterogeneous environments on any node (e.g., CPUs, GPUs, FPGAs, and DSPs for computing). Hierarchical networking- Edge is often optimized for a single type of network resource at the network edges, such as edge gateways, routers, switches, or licensed spectrum wireless networks. Fog supports a physical and logical network hierarchy of multiple levels of cooperating nodes, supporting distributed applications. Fog nodes extend the edge with support for north-south, east-west and diagonal connectivity, including interfaces between edge and cloud. This could include, for example, analytics algorithms distributed up and down a hierarchy of nodes, or massively parallel applications that concurrently run on large peer groups of processors or highly distributed storage systems. Universal Orchestration & Management- Edge orchestration and management are sometimes derived from specific legacy vertical practices, such as mobile network orchestration managed by the carrier. In these situations, the edge may deliver cloud capabilities but without orchestration for connecting edge nodes. Fog orchestration and management is intended to be more universal, modern, and automated. Fog orchestration enables resource pooling and permits interactions and collaborations between fog nodes at the same layer and at different layers in the hierarchy, which helps performance, fault tolerance, load distribution and load balancing. Fog network management considers a life-cycle management through a distributed service orchestration layer in each fog node. 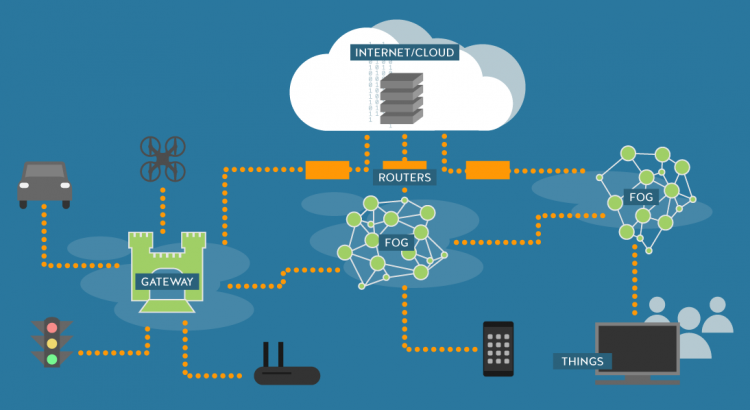 The fog architecture essentially validates IT (information technology), OT (operational technology) and CT (communications technology) approach. Modular Architecture with Multiple Access Modes- Edge deployments are typically based on gateways with fixed functionality. Edge architectures favor one specific access network, such as either wireless or wireline. Fog has a highly modular hardware and software architecture, permitting every fog node to be equipped with exactly the resources its applications need, that can be dynamically configured. Fog embraces both the licensed and unlicensed wireless spectrum, as well as copper and fiber wireline modes. Reliability and resiliency- Fog architectures are inherently reliable, supporting many fault tolerance, network resiliency, and fully autonomous emergency operation scenarios. If an edge device goes down, the services it supports will often fail. Security and privacy- Vertical application-specific and multi-vendor nature edge may offer uneven security protection. Whereas fog, on the other hand, requires every fog node to include a high-assurance implementation of its Trusted Computing Base using secure hardware or hardware-supported security mechanisms and a mandatory mission-critical class protection of communication and computation security mechanisms and a mandatory mission-critical class protection of communication and computation security. Virtualization Support- Fog supports virtualization and uses enterprise and web-scale models. This provides hardware virtualization at each node level and allows loads to be moved from one node to an adjacent node if the node is down or overloaded. Edge computing looks at virtualization mainly from the perspective of distributing computing resources in a local manner per server.